I shoveled snow today and didn’t have a heart attack. Small victories are big ones sometimes. Like a Texan surviving single digits. It’s exciting and depressing all at the same time. Know what else happened today? Unicorn vomit. That’s my nice way of saying, “My 4 year old dumped out millions of sequins onto the rug.” Was it sparkly and beautiful? Yes, to a 4 year old who dumped them. Between snow and unicorn vomit, and subzero temps, I am gonna need therapy. Until then, I’ve got soup. And by golly it sure helps. Since receiving my Instant Pot a few weeks ago, I’ve been really enjoying the science experiments, kitchen fun. 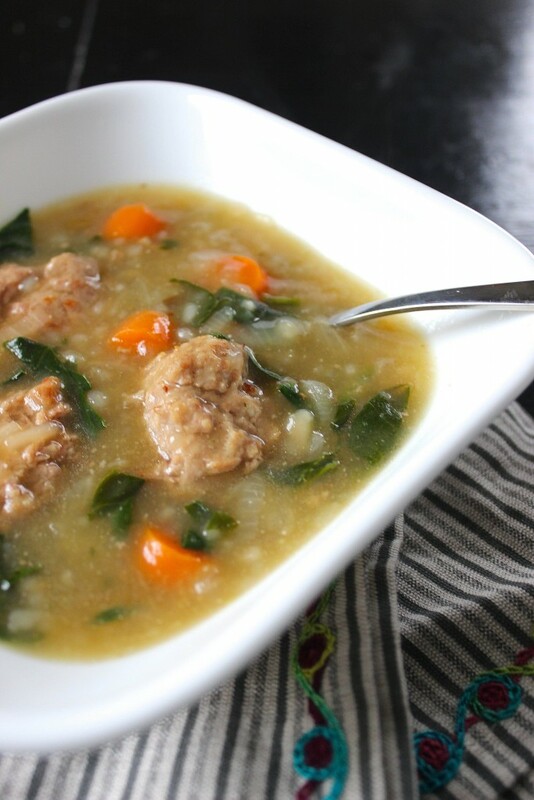 I’ve made BEEF STEW, MEATBALLS, and now this Italian Wedding Soup. I still get a little overly excited when I see a finished product so quickly after prepping it. And my hungry (read – impatient) family doesn’t seem to mind either! For this soup I opted for ground turkey meatballs and basically made them using THIS recipe, but omitted the ginger. I advise using an alternate flour besides coconut is preferred as a binder if you are able. Almond flour (not for AIP), water chestnut flour, cassava flour, should all work. You might need less of each, depending on which one you use. You should be able to roll the meatballs between your hands, so you can use texture as your guide. Optional: 1 cup Grain Free, Gluten Free Couscous (OMIT FOR AIP) – they sell this in groceries in the Jewish foods section or can be ordered online. In your Instant Pot, use the saute feature to cook your diced onion and tablespoon cooking fat until the onion is slightly translucent and begins to brown. If you are using Grain Free Couscous you can add that now as well. If you do not use this and want to thicken your soup, you can add in a slurry of 1 tablespoon tapioca starch with a bit of broth AFTER YOU COOK YOUR SOUP. Now secure the lid of your Instant Pot, close the steam vent, and set on MANUAL, High Pressure, a cook time of 10 MINUTES. It will take a few moments to heat up and then will cook for 10 minutes. After this you can quick release your steam valve or let it come down slowly. Once it is safe to open, you can remove the lid and toss in your chopped spinach. Stir well until spinach wilts. At this time you can also add in your tapioca starch slurry if you wish to thicken your soup. I just made this with ground pork instead of turkey and added cauliflower rice instead of the optional grain free couscous and it’s delicious! Thanks so much for this recipe. Did you add the cauliflower rice to the ingredients in the instant pot or did you add it to the soup after? 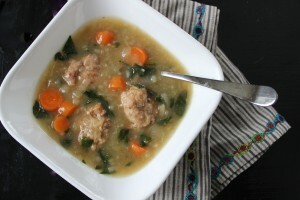 Italian Wedding Soup is my husband’s FAVORITE. We’ve been struggling to stay paleo but he’ll be thrilled that I can make his favorite without worrying! And I just happen to have a chicken carcass I was going to make broth out of 😀 Thank you so much for this recipe! I’m so glad Miriam! Hope he loved it! Made this tonight. Fast, easy and delicious!!! Looks amazing! Can I cook the meatballs in the instapot ? Or do you recommend doing it before in the oven? I just received my instapot in the mail yesterday! I’m so excited to use it! Yes you can definitely cook them in the IP, I recommend sauteing them first just a minute or two. Would you then add them in with the rest of the soup?? How would I make this recipe without an Instant Pot? You could bake the meatballs for 10 minutes and then combine the remaining ingredients into a slow cooker for 4-6 hours on high. Or similarly on stovetop for less time. I love this recipe! Can it be converted to a freezer meal? Thanks! I haven’t frozen this one yet but it should work! You might hold off on the grain free couscous if you use it and just add that after you reheat! Just made this in my instant pot – baked meatballs earlier today – it was delicious!!! Got your Paleo instant pot cookbook for Christmas and it arrived yesterday. Love it! Oh I am so glad to hear that! If you haven’t left a review and wouldn’t mind doing so on Amazon, I would be so so grateful for your positive feedback! Wow! This is the second time I’ve made this dish and it’s delicious! I’m wondering if anyone used a different type of ground meat, instead of turkey, and how did it turn out? My husbands not a big fan of ground turkey, so at this point it just means more for me ? But I’d like to change it if possible. You could definitely use ground chicken or beef or even pork if he prefers! I was going to use the precooked turkey meatballs purchased at HEB until I saw that they had bread crumbs in the ingredients. I was bummed as I don’t want to take the time to make my own meatballs. I think I’ll look for precooked meatballs without bread crumbs – if there are any out there. There are a few brands of meatballs that come frozen and are GF. You may need to check Whole Foods or another natural grocer. Autoimmune Protocol, it is a stricter form of paleo. This looks like a great recipe but if I don’t want to follow a paleo diet Can I use regular flour and olive oil instead of the ghee? Ghee is extremely expensive where I am. I also don’t have access to coconut amino and frankly I’m fine with Worcestershire sauce. So is it ok to sabstitue simple non paleo ingredients and still come up with a tasty recipe in the InstantPot for this?